Hospital Rooms and Eileen Skellern 1 have radically transformed the seclusion room in the Psychiatric Intensive Care Unit for women at Maudsley Hospital. Hospital Rooms and Eileen Skellern 1 have extended their multi-disciplinary collaboration, which originally commissioned 7 museum quality and compliant artworks for the ES1 communal rooms, to further revitalise the clinical environment on the unit. During our original project, the seclusion room was not within scope due to the need to keep it available in event of emergency. However, as the artworks and environments were completed in the communal spaces, the seclusion room began to appear more clinical and stark in comparison. In our evaluation of the initial project, we found that the creative process and the artworks challenged perceptions and biases: “At times, we can be quite black and white as clinicians- it is like this, it isn’t like this, this is the evidence. This isn’t like that, it’s all shades of grey and all colours’ and encouraged innovative thinking, ‘it feels like pushing boundaries….things you thought could never be considered at all, are now being considered’. As the Hospital Rooms and Eileen Skellern 1 collaboration had been so productive and fruitful, it was decided that the conceptual challenges presented by the seclusion room could be overcome and the project could be extended to re-think this space using the same approach of artist, patient and staff co-production. ‘Seclusion’, as defined in the Mental Health Code of Practice (Department of Health, 2015), is the supervised confinement and isolation of a patient, in an area from which they are prevented from leaving, in order to manage severe behavioural disturbance, which presents an immediate risk of harm to others. Seclusion should be an intervention of last resort and only occur in a specially designed room or suite of rooms. The seclusion room in Eileen Skellern 1 was low stimulus and safe, but it was also very bleak. Similarly the accompanying observation room for staff had no visual appeal or colour. 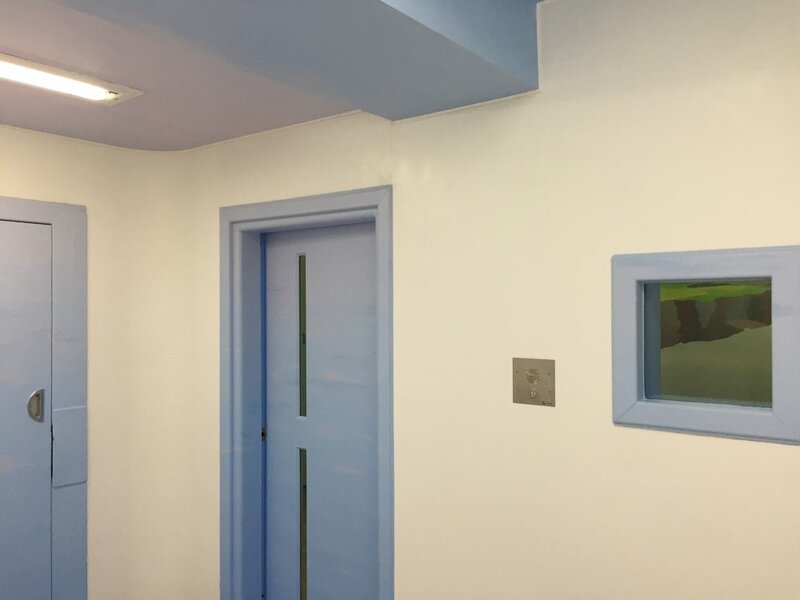 Hospital Rooms and Eileen Skellern 1 particularly felt that the dignity of patients in seclusion could be enhanced by making the environment more rejuvenative and comforting with high quality and compliant installation-based artwork. There is very little evidence to inform the design of seclusion rooms but there is general consensus that calming colours, daylight and views of nature provide an optimal therapeutic environment. 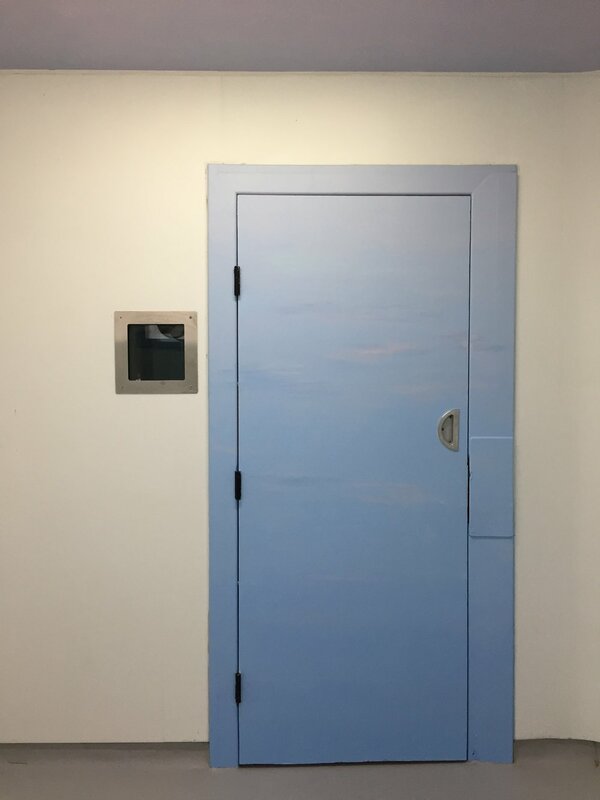 Hospital Rooms co-founder and artist Tim A Shaw worked with patients and PICU staff in creating this new immersive environment for the seclusion suite. He referred to the literature and recommendations for the environment, lead a creative workshop with patients to gather their thoughts and opinions on the space and consulted with the multi-disciplinary team to create the artwork. To begin the creative conversations, Tim painted a series of graded tones of analogous colours, chosen to move between vibrancy and calm. Staff at Eileen Skellern 1 PICU discussed the different shades and textures of paint and gave their insights into the way the seclusion room and the observation room are used. During a creative workshop at the unit, Tim encouraged patients to make their own painted colour combinations using mini rollers and brushes, and to consider and reflect on how these colours could be applied within the seclusion room. 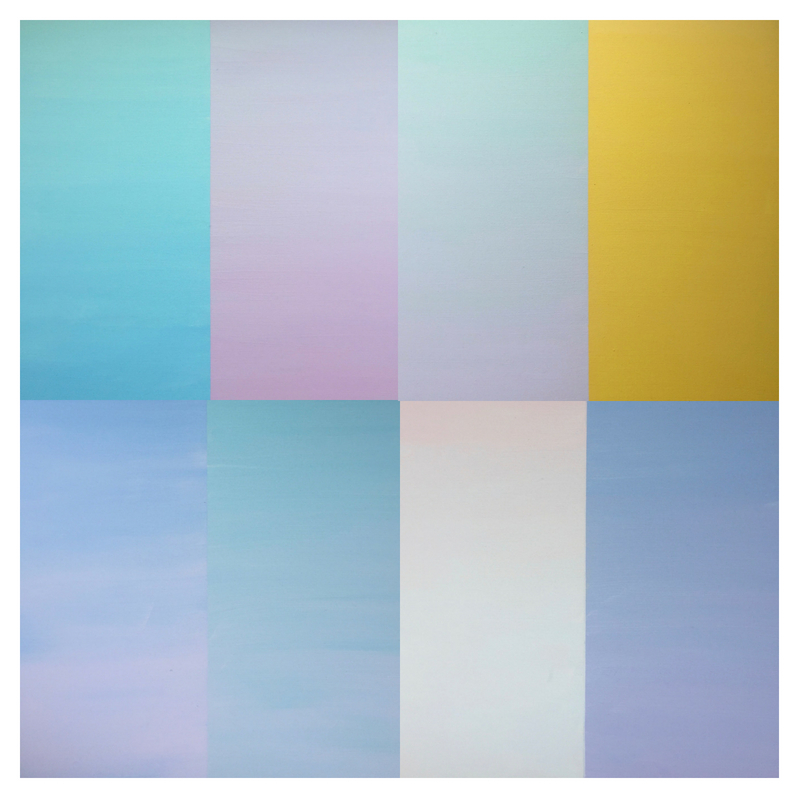 Several colour combinations were agreed upon by everyone, which included sky blues with pink tones, and soft yellows and greens. These formed the basis for a wraparound artwork in the observation room that moves seamlessly between several different colours along the walls, and a more painterly and textured painting on the ceiling and doors of the seclusion room that suggests a sky or a sense of distance. Also in the observation room, Tim painted a scene of land coming out of the sea in the distance. This can be viewed by a patient through the observation window from the Seclusion Room. This work follows an earlier major project at Eileen Skellern 1, which you can read about here. Eileen Skellern 1 (ES1) is a psychiatric intensive care unit (PICU) at the Maudsley Hospital in London. We offer care for women who live in the catchment area of South London and Maudsley NHS Foundation Trust. Our team includes health and social care staff from a range of professions. We provide semi-secure psychiatric and intensive hospital care for women who have severe and on-going mental illnesses. We provide assessment, treatment and intensive multidisciplinary care, and interface with a range of services inside and outside the healthcare setting. South London and Maudsley NHS Foundation Trust: provides NHS care and treatment for people with mental health problems. They also provide services for people who are addicted to drugs or alcohol. As well as serving the communities of South London, they provide specialist services for people from across the UK and beyond. Locally, they deliver mental health services for people living in the London boroughs of Croydon, Lambeth, Lewisham and Southwark; and substance misuse services for residents of Bexley, Lambeth, Greenwich and Wandsworth. They provide clinical services in seven London boroughs, with a combined population of nearly 2 million people covering an area of 168 square miles, rich in culture, diversity and architecture. They are part of an Academic Health Sciences Centre called King's Health Partners with King’s College London, Guy’s and St Thomas’ and King’s College Hospital NHS Foundation Trusts and their aim is to be a leader in improving health and wellbeing - locally, nationally and globally. Internationally they work with Macani Medical Centre an Abu Dhabi based organisation set up to bring the highest quality health care to the Middle East and North Africa (MENA) region.